When dressmaking forms a significant part of your professional role or educational system, our Dressmakers Tape is the ideal tool. It has been designed for measuring fabrics and taking body measurements for individual tailoring alongside other textile-related crafts. The flexible fibre glass body has been chosen for it's durability and flex. A pliable body allows the tape to be wrapped around circular or unusually shaped objects while still providing an accurate measurement every single time. The entire tool has been given a monochrome finish, with clear black line and number measurement indicators. When placed against coloured material, it ensures measurements can be taken accurately and the tape can be seen clearly at all times. At either end, small metal caps have been fitted to minimise the risk of damage and offer long life durability. 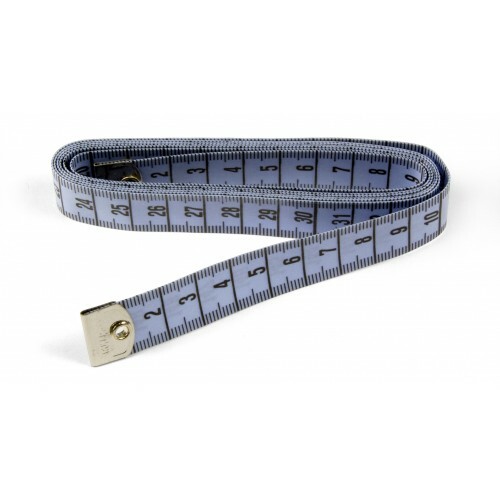 When extended fully, this dressmakers tape can be used for distances up to 150cm in total. It forms an essential part of your haberdashery kit, folding up compactly when not in use and sitting easily within sewing boxes, pencil cases or even pockets. The lightweight design also guarantees that it can be transported without issue and kept on your person at all times. Use to measure the distance between pins, take the hip-to-waist ratio of your clients or simply to ensure you cut right the very first time. As part of our bulk offering, we can provide an individual product discount when orders in larger quantities. For orders over 10, each tape will incur an individual price of £0.84. For orders over 100, each tape will incur an individual price of £0.72.